Samsung to sell refurbished flagship carrier-locked phones in the U.S.
Carrier-branded refurbished flagship phones from Samsung are now available in the U.S.
Last month, there was speculation that Samsung was going to start a program to sell refurbished flagship handsets as a way to compete with low-priced Chinese models. The latter are not really a threat to Samsung in the U.S., but the manufacturer has started offering carrier branded refurbished high-end handsets in the U.S. The phones have been completely fixed, cleaned up and inspected by Samsung, and come with a 12-month limited warranty. Inside the box, they will come with a new set of earphones, and a new charger. Refurbished models available in the U.S. include the Samsung Galaxy Note 3, Samsung Galaxy Note 4, Samsung Galaxy S5, Samsung Galaxy S6 and the Samsung Galaxy S6 edge. 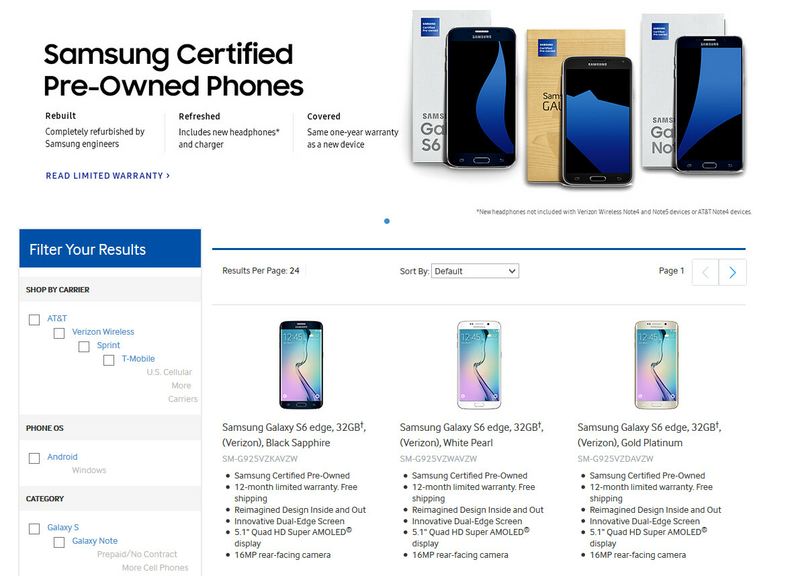 The phones available can be seen on the company's U.S. website under the heading "Samsung Certified Pre-Owned Phones." Models will be available for each of the four major stateside carriers including Verizon, AT&T, T-Mobile and Sprint. Purchases cannot be made using one of the carrier's Equipment Installment Plans (EIP). The savings can add up with some handsets priced as much as $256 cheaper than the cost of a brand new unit. If all goes well, Samsung might expand the program to other markets. If you live in the states and subscribe to one of the four major carriers, you might be interested in saving some money on your next handset purchase. If interested in Samsung's previously owned flagship models, click on the sourcelink. Hopefully they can make use of this scheme for Note 7 units which get replaced. Just at the right time. There is nothing wrong with the US version of the Note7. It's just a watse to replace them for no reason. I like Samsung a respect them for this replacement of devices. Apple didn't replace users phone when they caught on fire and exploded. Apple never recalled the 6 plus for bending or recalled their phones for easy to break glass or touch disease. Samsung already took care of the issue iSheep don't care, they just need something to b*tch about. To make them feel good, lets debate phones on merits. Damn, I need the s6 edge plus.